The aggressive high pitched squawks of gulls were all around me as I explored the centre of Fraserburgh. Some buildings were splattered in their mess. I used an ATM and noticed that it was corroded from the salty air. Fraserburgh is dominated by the sea and all that it brings. The highlight of the museum was being taken up the spiral staircase to see the light and then outside for the view over the sea. Whenever I see a lighthouse I always have a desire to go inside and up the stairs to the top, but many are not open to the public so it was quite a treat to be able to do that here. It looks like a castle with a lighthouse stuck on the top and that is exactly what it is. The castle was built in 1570 by the Frasers, a wealthy land-owning family, who gave their name to the town. In 1787 the castle was converted to Scotland’s very first lighthouse. “The uniform provided by the Commissioners is to be the normal daily dress, but overalls may be worn when cleaning, painting or doing any work for which uniform is clearly not appropriate.” Northern Lighthouse Board Service Regulations. I have always been fascinated by the lonely life of lighthouse keepers. What struck me was that despite this being an isolated profession there was a heavy emphasis on smart appearance and always wearing a uniform. Inside the bedroom I discovered a tie flattener! This consisted of two bits of wood with a clamp so that the keeper’s tie could be pressed. I was surprised to discover that pay was not very good and it was common for keepers to have a second job. Fraserburgh feels like a town at the edge. There are not many independent shops, there are some empty units and some buildings look in need of some care. The prominence of nightclubs and pubs hints at a strong drinking culture. It feels cut-off, possibly because it has the sea on one side and then miles and miles of farming countryside behind it. The lack of a railway service, cut in 1965, adds to the sense of isolation. There is virtually no evidence remaining of Fraserburgh’s train station. Roads, car parks and service yards stand where there were once tracks and an elegant canopied terminal. “The night air was now stilled; the train darkened and empty; the platform deserted. I turned and walked through the barrier- the last passenger to leave the platform at Fraserburgh.” The occasion of the last ever passenger train to arrive at Fraserburgh, from The Story and Tales of the Buchan Line by Alan H.Sangster. The best part of a ride on a train to or from Fraserburgh would have been passing the surf and dunes with spiky grass poking out the top. The town’s beach is one of the most beautiful I have seen in Scotland which is at odds with the urban landscape. I didn’t enjoy the town centre. I walked around it several times trying to find something endearing, but it is not that kind of place. It functions to support the fishing industry, not to amuse the tourist. It was time to leave town. I was cycling back the way I came, going over the same gravel, under the same tunnels and over the same bridges. Would I get bored of the Formartine and Buchan cycle way? Not at all, because I was outside on my bike in the countryside. This can never be boring. Besides there were still new things to discover. A massive clump of foxgloves, blue and white, were so striking that I pulled on the brakes to take a closer look. A buzzard was sat on a fence post. We looked at each other and then he took flight. He swooped above me and I could see his head moving side to side to look at me. Then he sat on the air currents, floating above me, for several minutes. Then he got bored of me and flew off. At Strichen, 10.5 miles from Fraserburgh, there is a stone circle. I had to park up the bike next to a stream and hike up a steep hill to reach it. I marveled at how people managed to drag these huge stones up here when they weigh up to four tons and this happened 4000 years ago. It is understood that the stones were put here for some sort of ceremony that involved the moon. The largest stones, one flat one and two upright stones flanking it, were arranged so that the moon could be seen between them. The only other stop I made on my return journey was to Udny Station Hotel for a sandwich. The building looks like a small cottage and inside there is a cosy bar with roof beams. The station hotels are another legacy of the rail line that survives today. Many of the towns along the route had a station hotel and today they keep the name even though the trains and track have been gone for over forty years. That was the thing about the Formartine and Buchan Way. I always felt that my tyres were treading on ground that once connected rural communities and provided jobs and opportunities. I love that it allows for traffic-free cycling in the North East of Scotland, but it is also a shame to see the deserted and overgrown platforms. Wildflowers, birds and other creatures have reclaimed the line and added to the enjoyment of the cycle, but passing through a tunnel or along an embankment I can't help but feel that the place is missing the whistle and rattle of a train. The Formartine and Buchan Way begins in Dyce. Part one of the route from Dyce to Mintlawy is described in Platform of life. Dyce is a 10 minute train journey from Aberdeen. Aberdeen can be reached by train from Edinburgh in around 2 hours 20 minutes. From London journey time to Aberdeen is around 7 to 8 hours. This map shows the Formartine and Buchan Way from Dyce as far as Mintlaw. The stretch from Mintlaw to Fraserburgh shows the road route, as the map function does not yet cover the Formartine and Buchan Way for this section, but it gives you a good idea of where places are in relation to each other. It is 41 miles from Fraserburgh to Dyce on the Formartine and Buchan Way. This is as easy as cycling gets. Flat, no traffic and impossible to get lost. The surface varies from tarmac to gravel and paths that turn to mud in wet weather. It can be slow going on some of the surfaces, particularly the chunky gravel. Some sections can be very narrow, particularly in the summer months when trees and bushes are overgrown. At each former train station there is an information panel describing the history of the railway, wildlife that can be spotted and what there is to see and do nearby. There is a great book about the history of the line, crammed full of photos, called Story and Tales of the Buchan Line. Maud station has a museum about the Formartine and Buchan railway. The opening hours are limited as it is run by volunteers. It tends to be open once a month at weekends April to October. 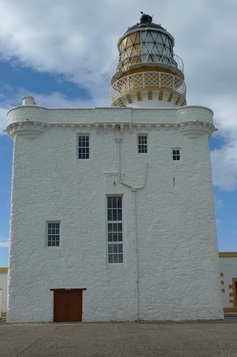 The Museum of Scottish Lighthouses is in Fraserburgh and home to Scotland's very first lighthouse. There is an admission charge that includes the tour of the lighthouse and a trip up the spiral staircase to the top. 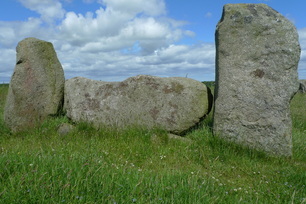 Strichen Stone circle is free to visit and has good views of the surrounding countryside. I stayed at Findlay's Hotel, located in the suburbs of Fraserburgh. The rooms are modern and comfortable and cost £75 for a double, including breakfast. The restaurant provides tasty and filling bar food like fish and chips. Udny Station Hotel, 8 miles from Dyce, is a good place to stop for a snack or drink. They have a good selection of whisky and the menu includes venison, duck, haddock, salads and burgers.